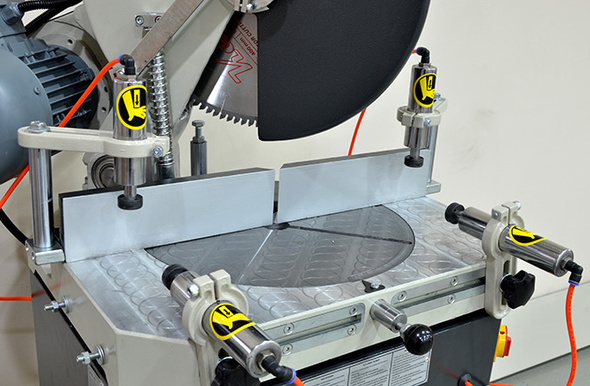 How to cut aluminium profiles with a mitre saw machine? How to cut aluminium profiles with a mitre saw? Baertec is manufacturing machines with one head and two heads for different cutting lengths. Our standart mitre saw cutting systems with two heads have a maximum cutting length of 3400 mm, if your project needs a machine with 5000 mm or 6000 mm cutting length? Baertec can manufacture for your the S series machines which means special size. We as Baertec are always manufacturing high quality machines with I long agelife. This is the reason why we are working only with high quality suppliers of the spareparts to offer our customers the best from the best. Everybody who are using a Baertec cutting machine for aluminium profiles will feel the difference, because with our patented systems and the high security options for the operator of our machines make the difference.